Creative Robotics™ Learning Center (abbreviated to “CR8®”, pronounced “create”) is a company dedicated to prepare the youth of today for the world of tomorrow by infusing soft skills (such as communication, teamwork, problem solving and observation) in a fun and exciting way so that students will not be left out in today’s fast-paced, technology-oriented world. They are the “Young Creators” that may one day engineer a better tomorrow. 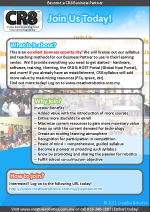 CR8® would like to extend a warm invitation to hop onto the robotics bandwagon with us and become a CR8® Business Partner. Our syllabus has been successfully tried and tested over a period of around 9 years (as of 2014). Progress waits for no man – technology constantly improves by the day. Become a CR8® Business Partner and be part of the trend today! CR8® Centers have a "territory" radius - sign up quick if you are eyeing a particular area before it's too late! HOP ONTO THE BANDWAGON TODAY! If you are interested, please drop us an email with the following details and we'll arrange a meeting if the details are deemed legitimate. Please note that CR8® Syllabus, Trademarks and IPs are protected by Copyright Laws. All rights reserved. • How did you come to know us? *ALL details are required! Write "None" for Company if applicable.